Last-minute cancellations are the top complaint for Airbnb guests. But what's the home-sharing platform doing about it? It was supposed to be a dream vacation to mark a milestone birthday. To celebrate his 50th birthday, David Jackel planned the trip of a lifetime to Huatulco, Mexico, booking his accommodations on Airbnb a full six months in advance. But a last-minute cancellation left Jackel scrambling during the busy winter holiday season, and the Alberta man said he had no choice but to book much more expensive accommodations — at more than $6,000 over his original budget. Jackel and his wife wanted to spend one week at an all-inclusive, followed by five weeks at a condo rented through Airbnb. 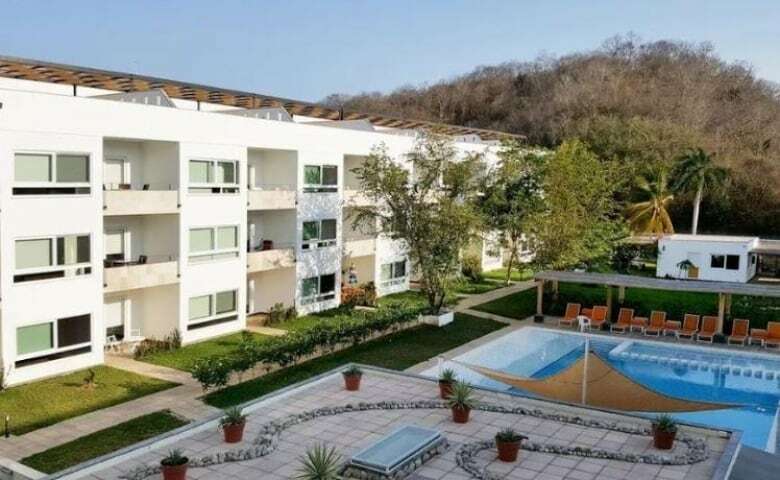 For the latter part of the trip, Jackel booked a two-bedroom condo with air conditioning, Wi-Fi, laundry and access to a pool and gym for around $1,300. "It's where we wanted, the place was exactly what we wanted, and the price almost seemed too good to be true," said Jackel. It turns out it was. Three days before he was due to check in at the Airbnb, Jackel was in the lobby of his all-inclusive resort when he got a text saying his reservation for the next five weeks was cancelled. "I'm just like, OK, so this is just a joke … They're having some fun with me," he said. But a message from his host confirmed that due to complaints from the last guest, he wanted to fix some things before hosting anyone else. "The only thing that [Airbnb] had to say was [it was] extenuating circumstances," Jackel said. When a host cancels at the last minute, Airbnb says hosts can face penalties, including being charged a cancellation fee. Guests are then offered a refund or a credit to put toward a new listing. Jackel's credit was $92 — 10 per cent of his original deposit of $920. Due to the last-minute cancellation, Airbnb had only two replacement options to offer. "Price-wise, the comparison was spot on," said Jackel. "Amenity-wise and everything else, not even close." There was Wi-fi, air conditioning and laundry but neither suggested alternatives included access to a pool or gym. Correspondence between Jackel and Airbnb, reviewed by Marketplace, show that hours go by without an answer from the Airbnb agent assigned to Jackel's case. 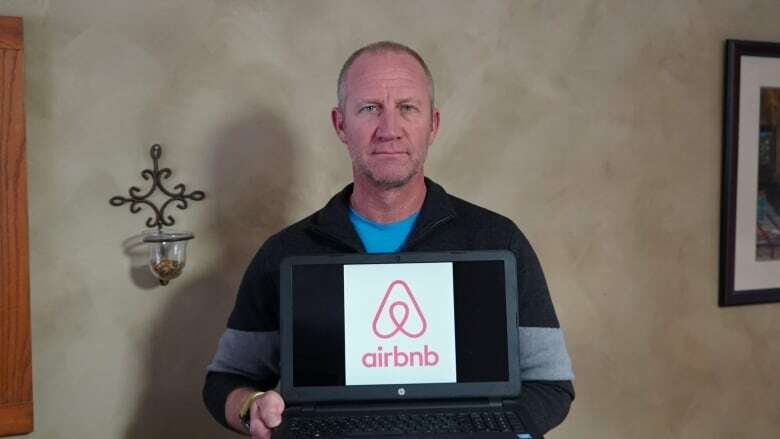 Feeling stressed and in need of a place to stay, Jackel booked what he said was the only suitable alternative on such short notice: Another Airbnb unit at nearly six times his original budget — about $7,400. Jackel said he opted to book through Airbnb once again to try to recoup the costs of his new rental. The company's website says that in the event of a host cancellation, Airbnb "may help cover a portion of the difference" when rebooking. There is no indication of how much that may be. Correspondence between Airbnb's customer service and Jackel shows that the company stood firm on its $92 rebooking credit. Jackel was requesting at least a partial refund for the $7,400 backup rental. But after three months of phone calls, nine different customer service representatives and countless exchanged messages, the company sent a message on Feb. 28 that read: "We have decided that decision is final." Then just a few hours after Marketplace reached out to Airbnb to inquire about Jackel's experience, he received a message from a 10th Airbnb representative, who agreed to refund the full difference between what Jackel had already paid for original listing and the cost of the new listing — about $6,400. Airbnb did not respond to Marketplace'squestions about why the refund was granted, but the company did confirm that Jackel had received a full reimbursement. After experiencing two back-to-back "Airbnb nightmares," travel blogger Asher Fergusson analyzed more than 1,000 Airbnb horror stories between October 2016 and October 2017 to determine what's most likely to go wrong when booking with the online home-sharing platform. His study found that host cancellations are the top complaint, with 20.5 per cent of guests complaining about the issue. Such cancellations can be tied to a scam for hosts looking to make more money, according to Fergusson. "The host has different listings on Airbnb and maybe other [short-term] rental websites," he explained. "They list them at different price points." If one guest books on the higher-priced platform, the lower-price guest is then cancelled, he said. Rachel Weldrick believes something like that happened to her. In February, while planning her sister's bachelorette party, she booked a luxury Airbnb for eight friends in downtown Toronto during Mother's Day weekend. "I spent ... hours, quite frankly, looking for the right type of unit to book for this weekend," she said. "When you're booking a unit for eight guests … you want to make sure that the accommodations are right and the location is right." The weekend's accomodations were going to cost them around $690; split between eight, it seemed reasonable. But nearly a month later, a cancellation email arrived without explanation. "I was incredibly frustrated," said Weldrick. As per Airbnb's policy, Weldrick was given a full refund. But while searching for a new place to stay, she came across her original rental on Airbnb once again. "I recognized all the photos and I realized that it was listed for more than double what I had originally booked for." It was the same photos and the same host name — but listed under a new profile. To rebook the listing, the new cost to Weldrick would have been more than $1,750. Rachel Weldrick booked this Airbnb listing for $690 for two nights in May. Her reservation was cancelled about a month later. She then saw it reposted, and the price was more than doubled. "I was completely shocked when I saw that it had been reposted for double the price. I felt that the host had taken advantage of me … As if my travel plans, my money, my time meant nothing," said Weldrick. 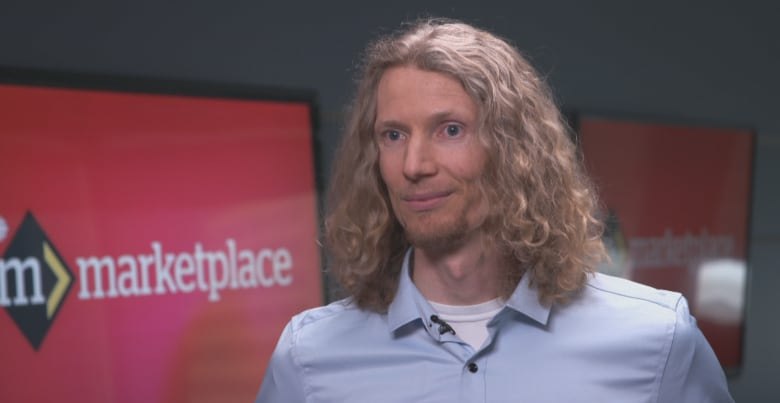 When Marketplace called the number associated with the listing, a man who identified himself as an employee of a property management company blamed the cancellation on a third-party software issue. He said that the property should have been listed at a higher price for those dates. The man admitted that the property was listed on multiple sites and that double-booking sometimes happens. When asked why they wouldn't honour Weldrick's original price, he said: "We obviously feel terrible … But are we going to lose thousands of dollars because we feel bad? Like, we can't live our lives like that." Marketplace repeatedly tried to contact the host directly, listed on Airbnb as "Reid," prior to publication of this article. 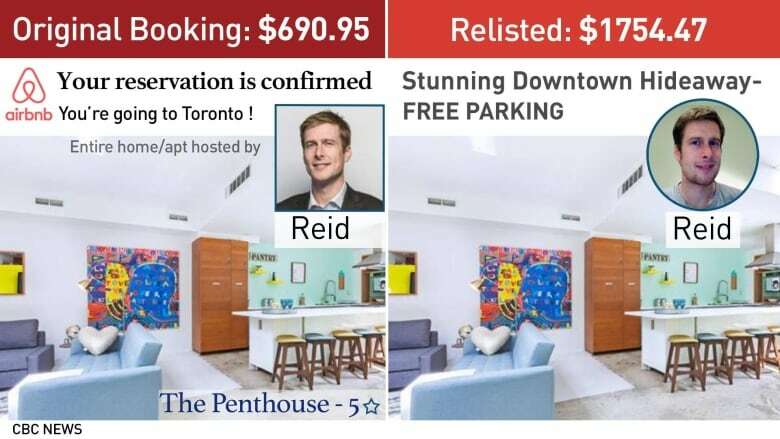 After publication, Reid reached out, saying he had no knowledge of how the third-party property management company he hired was operating on Airbnb, including using his image and name. Airbnb told Marketplace that "negative incidents are extremely rare, but when issues do happen, we work to make them right." But when Weldrick reached out to Airbnb, she said she didn't get much help. As for finding a new place to stay, Weldrick hasn't been able to find anything comparable. "At this point, we've been looking. But quite frankly we are not able to find anything in the same neighborhood for the same price at all. And so for lack of a better term, we've been screwed." Weldrick also said she won't be using Airbnb again. "I need to be sure when I book travel accommodation that it will be reliable. And at this point, I'm not sure I can trust Airbnb to be reliable." So who bears the responsibility when a host cancels at the last minute? "In the unusual event that a host cancels a reservation at the last minute, Airbnb will assist in finding an alternative listing and transfer fees to this new booking or provide a full refund to the guest," Airbnb said in a statement. The company also said hosts can be penalized for disrupting guests' plans, including being charged a cancellation fee or having accounts suspended for multiple cancellations. An automatic review indicating the cancellation is also posted to the host's account and that account can't accept reservations for those same dates. Host penalties ultimately didn't help Jackel. "The whole thing on this one was, it was not my doing," he said. "If I was to cancel on my host, I'm out that money, I accept those responsibilities. Hosts cancelling on me — Airbnb and that host should be responsible for that." "They do all the marketing, create this glossy image of some dreamy vacation for your family and they take a big cut of the transaction and you're trusting them." he said. "They are the middlemen that create this platform to make it possible, so they're the ones who need to be the police."